This post is from Jake, aka The Beer Tool Man. After being virtually introduced to him and seeing that he’s a new Etsy shop owner and being knocked out by his shop announcement (seriously – it’s killer), I asked if he’d want to share anything with you kids on this here blog. Thankfully, he obliged twofold: with a post and a giveaway! First, as humans we hate admitting that we don’t know something, overall it makes us uncomfortable. You think I’m wrong? Just ask a husband to pull over to ask for directions (if people still get lost anymore thanks to GPS). We want to know everything, the unknown is uncomfortable and it’s that simple. The best part is that this is easy to overcome because all you have to do is try. Take baby steps, start doing one thing a day that makes you get out of your comfort zone. Within a week you’ll be addicted, you’ll look forward to new and exciting things instead of being anxious about the unknown. Your life will be better, 100% guaranteed. 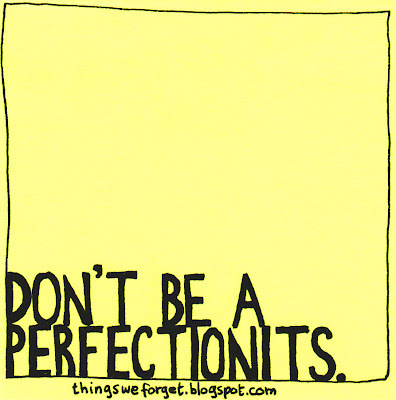 Next is the dreaded word “Perfect.” I’ve started to try to eliminate that word from my vocabulary and you should too. Face it, there is no such thing a “perfect” and you should never ever try to obtain it. I found a quote recently that I’ve come to live by which states “Done is better than perfect.” When I read this it hit me square in between the eyes. I’ve always taken pride in the details, but this quote helped me see that trying to make (insert your passion here) perfect was keeping me from doing anything! My new motto these days is currently “Screw it, let’s get started and see where it goes” which is working great. Using this “anti- unknown” and “anti-perfect” thinking I’ve recently started my own company selling “Beer Tools” which are freaking wrench shaped bottle openers?!? Where the heck did that come from? I got the idea one night and instead of stopping myself by trying to design the “perfect” opener I stepped out into the shop and made it. I took the first step and then another and another then before long I had a cool product. I did not let the details slow me down. After some market research (A.K.A. showing off while drinking beers with friends) I found out that people liked the Tools so I opened an Etsy shop within 24 hours. Once the product was on the virtual shelves the marketing and branding quickly followed. Another bonus of the “anti-perfect” thinking is that you will always keep improving; nothing is perfect so you know that it can always get better. That’s what’s helping me and my shop get better every single day. Now that I’ve rambled on for 569 words it’s your turn. I challenge you to do ONE thing a day outside your norm. I’m not telling you to go skydiving (which I’ve done and it’s awesome), but I am telling you to get out there and experience the new. Embrace it. Second, take that first step. Have you always wanted to become a Spanish tutor (my wife) or a life coach (Michelle) or _________? If you’ve wanted to do anything ever, start now!!! Take that step and become the person that you’ve always wanted to be, it’s all downhill from there. P.S. – If you’ve read my nonsense and put it into action I would love to hear from you. Drop me an email at Jake@TheBeerTool.com and let me know how it goes. P.P.S. – Wanna win the Beer Tool pictured above? Comment below with your thoughts on my post and/or who you’d give The Beer Tool to before 11:59p on Monday 2/6. Michelle’ll pick the winner via Random.org and will announce it here on Tue the 7th. That means The Beer Tool will get to you by Valentine’s Day! The winner of The Beer Tool is Darlene! I’ll be emailing ya soon with the deets. Enjoy, enjoy, enjoy! Jacob Crawley is in his late twenties and calls himself “a guy with a PR degree, too much time on his hands, and a deep desire to make/tinker/create and share his ideas.” He’s lucky enough to be living in historic Savannah, GA with his “overly supportive” wife Kristen and his sidekick Roxie (their Lab/Basset hound mix). This post hit right where it was supposed to hit… I've spent the last two weeks worrying about a report I had to write at work, and I've been really strugglign to get everything right and dandy with it. I've spent hours researching, I've made numerous phone calls, I've cried some, I've changed snetence structure more times than what's healthy. And as I sent it off yesterday, I was totally exhausted. I walked around in a bubble for the rest of the day and then in the eveing realized that I had totally overworked this whole report as there will probably only be about three people reading all of it…. And this happens to me again and again. So, I'll try to live by "Done is better than perfect"… Wish me luck. Thanks so much for this…. I've been more or less paralyzed for a couple of days re a freelance writing assignment because I'm really not sure of the "right" way to do it (and I feel like I've asked too many questions already). You are absolutely right — "done" IS better than "perfect" and I could probably spend weeks I don't have spinning my wheels over this rather than just diving in, turning the damn thing in, and then if they don't like it, I'll fix it. My business style is TOTALLY “Screw it, let’s get started and see where it goes”. That is, after years and years of dreams heaped on dreams and plans that got sketched out but never taking action. I have to say, it's working pretty well for me too! It doesn't always lead where I expect, but usually I'm pleasantly surprised 🙂 Thanks for sharing, Jake! Thanks, Jake. I just got The Beer Tool in the mail today and cannot wait to use it tonight when I get home from the office! I've been showing it off to everyone I see. Article coming soon (after our beer tasting event).